A heartwarming, contemporary parable, The Way of the Shepherd offers a fresh perspective on the art of leadership in this account of a cub reporter who lands the interview of a lifetime with the most respected CEO in America. Through the interview, the businessman shares seven proven management principles that, while ancient in origin, are readily applicable in today’s fast-paced, high-tech world. Compelling and challenging, these uncommon, age-old principles require leaders to focus on their own hearts, character, and priorities, and to give their best in order to receive the best from others. Readers also discover insights and techniques for engaging and energizing their workforce, and for leading people in a way that helps them see their work as a calling rather than merely a job, as a place to belong rather than just a place to work. 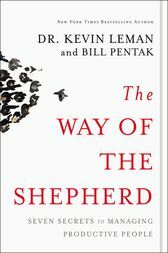 A concise story that’s full to the brim, The Way of the Shepherd is a must-read for busy leaders at all levels who want to call forth greatness from the people around them by cultivating it in themselves.